But there is one method which is not only helpful in preservation but can create a natural flavour for the food, and that is drying it under the sun. Specialties preserved by this method are familiar, but to create an excellent and unique specialty, is another story. This week’s story is about bò một nắng (beef dried in the sun) – a signature specialty from the Tây Nguyên (Central Highlands). Last month, we went on a volunteer trip to the Highlands. Our destination was Krông Pa – known as the ‘fire pan’ of Gia Lai Province due to its extraordinary heat. One of the poorest districts of Gia Lai, and with temperatures of up to 41 degrees, drought is a very serious issue. There isn’t enough water for living, basic farming and especially feeding cattle – the main activity of residents. Stopping in Đất Bằng Commune – which has suffered most from the drought, we helped authorities build a clean water tank and hold classes to teach people about saving and using water. To express their gratitude, residents invited us to stay for lunch in a traditional communal house, to try traditional specialties and talk with the locals. Dig in: Bò một nắng with yellow salted ants is much more enjoyable. Surrounding us were diverse kinds of delicious specialties such as Bản Đôn grilled chicken, venison, grilled wild boar and Gia Lai dried phở. But one dish that impressed me was the bò một nắng. Although it was just beef, I had never tried that kind of beef before. It was grilled on the outside, but the inside was still pink. It was perfect to accompany a drink as the beef’s flavour is a delicate combination of the dried spice on the outside and the soft, greasy fragrant layers underneath. “Wow! It has a very unique and natural taste. I’m very impressed as I used to think that there can’t be any new way to cook beef. But it turns out creativity is like a moving bicycle wheel – to always move forward, we have to cycle and brainstorm new ideas, and the idea of making this kind of beef is brilliant,” said Nguyễn Mỹ Linh, another member of the volunteer group. Ngô Minh Hòa told us an inspirational story not only about the origin of this food, but also about the way locals overcome the harsh weather. “The reason we call it ‘một nắng’ is because it is already ‘roasted’ once before the second roasting. We take advantage of the heat and our cattle in Gia Lai to expand the scale of producing this specialty. After the early cooking process, we dry the beef under the strong sunlight. With the typical heat of Krông Pa, it takes 30 minutes for the beef to completely dry out. 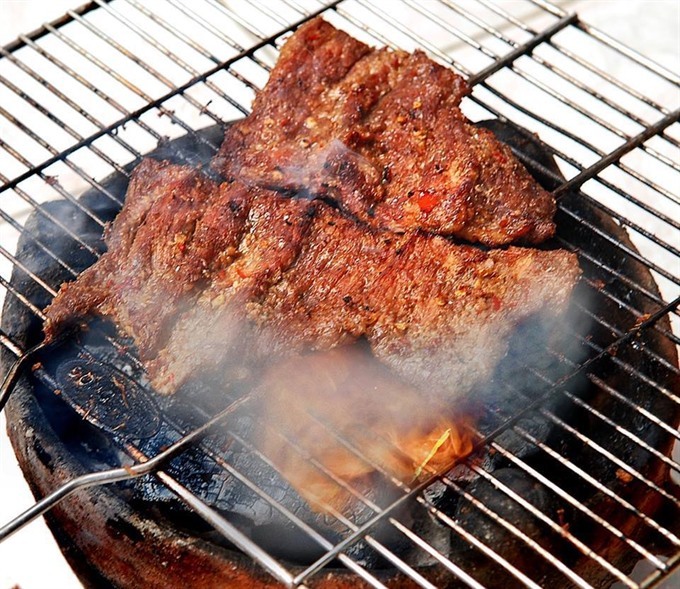 This stage eliminates bacteria and gives the beef a really natural aroma,” said Hòa. “We used to get depressed when thinking of how much damage this terrible sunlight had done to us. We watched our Ba River evaporate from a majestic current to a small stream. But instead of sitting there and waiting for a miracle, we stood up for ourselves and turned the disadvantage into an advantage,” he added. 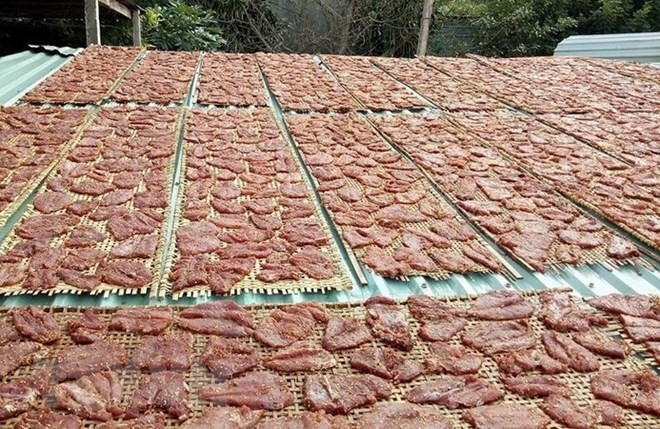 In the heat: Drying meat under the sun makes it more delicious. What surprised us more was the spice used with the beef. It was brown, a little bit sour, spicy and salty. But above all, it tasted very delicious, natural and paired well with the half-dried beef. Hòa’s answer stunned us once again. The spice isn’t made from sea water like other kinds of salt. It comes from an unwanted creature – ants. 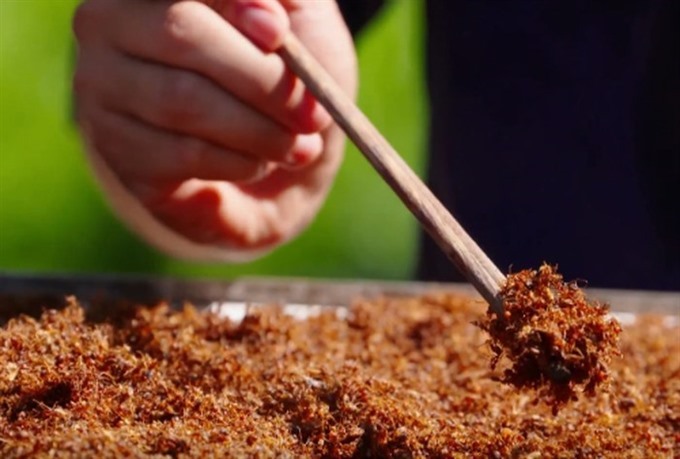 They are yellow ants, one of the specialties of the region. They live in trees in the forest or fruit trees of Krông Pa and contain a lot of nutrients. After lunch, with some pieces of bò một nắng and yellow ants to take home, Hòa showed us the process as his store. “In order to maintain the signature flavour of this “fire pan” area, the flesh has to be taken from the thighs of the bulls, cut into small pieces of one centimetre, then marinated with mixed spices of salt, chili powder, garlic, lemongrass and sesame. The beef has to be perfectly marinated. If it’s too salty, it will lose its original flavour; but if it’s too bland, it will rot,” said Trần Thị Thiên, one of the most experienced cooks. In Krông Pa, locals have other ways of making the yellow salted ants, such as adding cinnamon leaves. With prices ranging from VNĐ450,000 to VNĐ500,000 per kilo of bò một nắng and VNĐ20,000 for one box of yellow salted ants, it is really worth a try. Now, every time we have a drink, I always bring this special snack with me, share it with others and talk about the trip to Krông Pa – the home of this amazing gift from the wild and majestic Central Highlands.